It's not every tournament that witnesses the losses of three ITF junior No. 1s before the finals, but this year's Metropolia Orange Bowl can claim that distinction, with two of them losing in Saturday's semifinals. CiCi Bellis, who will take over the No. 1 position on Monday and finish the year there, was beaten by No. 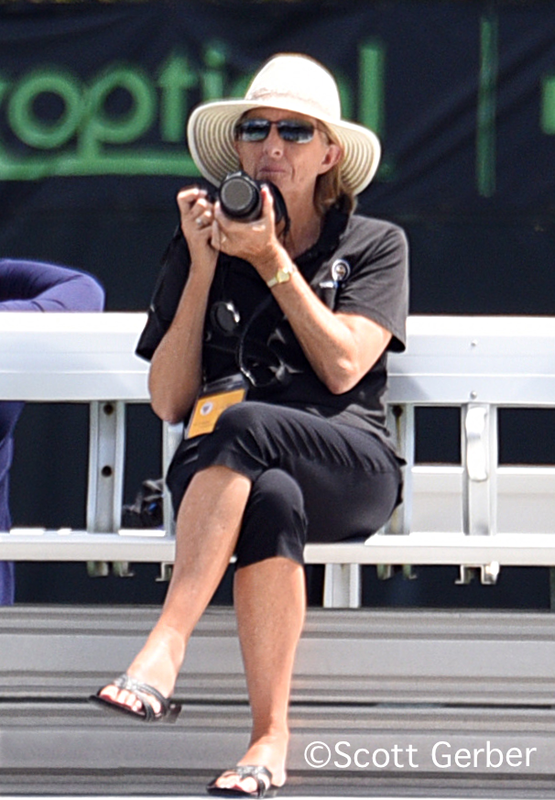 13 seed Sonya Kenin 6-3, 6-2, while current boys No. 1 Andrey Rublev of Russia lost to unseeded Stefanos Tsitispas of Greece 6-4, 7-5. Bellis had earned the No. 1 spot by winning Friday after current girls No. 1 Shilin Xu lost in the first round of singles and doubles. Kenin had lost to Bellis twice earlier this year, both in three sets on California hard courts, but the 16-year-old from nearby Pembroke Pines loves the Har-Tru courts of the Frank Veltri Tennis Center and has been playing outstanding tennis on them the past three rounds. "I like this tournament a lot," said Kenin, who was a semifinalist last year. "It's my hometown and I like competing here. I'm really glad that I'm in the finals. I'm speechless." Kenin won a long tough game to break Bellis for the first set, and then took control, going up 5-0, as Bellis was having difficulty keeping the ball in play. But the 15-year-old from California held and broke before Kenin quashed Bellis's hope for a comeback by breaking for the match. "I had a game plan," said Kenin. "I was moving her, I served really good and I've definitely improved my forehand. When I played her before, my forehand would always break down. I like this surface and I like hard, so it doesn't make a difference. I try to play the same way." Kenin pronounced Saturday's victory as the most important she's had. "Yes, this is my biggest win," Kenin said. "We've always played each other in the semis, always, and she ended up winning the tournaments. So I want to win this tournament." To do so, Kenin will need to get by qualifier Ingrid Neel, who won her eighth match in eight days, beating unseeded Monika Kilnarova 6-2, 4-6, 6-4. The 16-year-old from Minnesota, who trains at the IMG Academy in Bradenton looked to be on her way to a routine victory up 6-2, and serving at 4-3, but she dropped three straight games, looking understandably tired. Neel managed to regroup for the third set however, which played out much like the second, at least until the last few games, with Neel up early and Kilnarova battling back. "It's all about the heart at that point," said Neel. "It's the most fun part of the match, so you've got to enjoy it. Take it as a good opportunity, and that's what I live to play tennis for." Neel, who frequently approaches the net to finish points, found that part of her game difficult to execute against the 15-year-old from the Czech Republic. "At the beginning she would go down the line on her passes and then she starting going cross court, so I didn't really know which way she would pass me. It was hard to read it, so that was a problem," Neel said. When Neel got her fourth break of the final set to take a 5-4 lead, she built a 40-0 lead, but even then Kilnarova kept the pressure on. She passed Neel to save the first match point, and Neel missed a forehand long after a lengthy rally to drop her second match point. But determined to challenge Kilnarova one last time, Neel approached the net again, and this time Kilnarova's forehand didn't clear the net. "I'm glad I ended it at the net," said Neel. "That was very nice. It was 50-50 in the rallies if I was going to win, so I came to the net, and let the chips fall where they may on that last point and I got it. My shot was just good enough." Neel lost to Kenin 6-1, 6-4 in the quarterfinals of the USTA 18s National Championships in August. "She was playing really well in the match I played her," said Neel. "She can be really on with everything, her drop shots, she has it all. So I'll just try to play my game, come to net, all that good stuff that I love doing. It's time for revenge, I guess." In the boys final, second seed Stefan Kozlov will take another stab at an Orange Bowl title after losing in the 12s and 14s finals in 2009 and 2011 and falling to Francis Tiafoe in the Grade A final last year. Kozlov defeated unseeded Reilly Opelka, the Eddie Herr champion, 6-2, 3-6, 6-1 to earn his place in the final against Tsitsipas. Kozlov played well to open the match, and Opelka double faulted to get broken and give Kozlov a 3-2 lead, which he added to with another service break. In the second set, Kozlov surrendered the only break of serve, playing a little too casually, and Opelka closed out that set with a love hold and an ace. At 1-1 the third set, Kozlov escaped from a 15-40 hole, winning the next four points and got a break in the next game. When he earned another break point with a stunning passing shot, Kozlov gave an excited fist pump and on the next point, got the insurance break he needed for a 5-1 lead. "We were playing quick," said Kozlov. "The points were going quick, the games were going quick. His service games were like love in like minutes and in the third set I just wanted to change it up again, get momentum back. At 1-1 15-40 he was starting to get into the zone and I kind of got lucky a point, let out some emotions and got going again. I played a great game to break and from there I just took off again." Tsitsipas, Kozlov's opponent in the final, is something of an unknown, having played in only three Grade As including this week's Orange Bowl, and no junior slams. Against Rublev, Tsitsipas said he had zeroed in on what he considers the 17-year-old Russian's weakness. "I think he doesn't like spin balls on his forehand," said the 16-year-old, who came into the tournament ranked outside the ITF Top 100. "He's still a very good player and you need to play very good to beat him, be on your best day." Tsitsipas, who has a one-handed backhand, said both sides were crucial to his success Saturday. "I was pressing with my forehand a lot and I was playing deep to his forehand a lot and he didn't like the spin balls," said Tsitsipas. "And I made very good backhands down the line, winners that helped me in some crucial moments and points." Tsitsipas, who received congratulations and photo requests from a dozen or more fans after the match, said he was getting support from those back home in Greece too. "I was dreaming about the Orange Bowl final, but I didn't know the feeling is so great," Tsitsipas said. "I am so happy. Everyone in my country is so happy about me, they support me from Greece and send me messages daily." Kozlov said he doesn't know much about Tsitsipas but expects him to play well in Sunday's final. "I don't know much of him, but obviously he's playing well here," Kozlov said. "I've watched him a couple of times this week. I'll get some tips from my coach." As for his thoughts on yet another Orange Bowl final, Kozlov said, "Hopefully this is the one, but we'll see. It's just another match tomorrow." It's actually two finals for Kozlov on Sunday, as he and partner Michael Mmoh reached the doubles final. The top seeds defeated unseeded Nathan Ponwith and Tommy Paul 2-6, 6-3, 10-4 in the semifinals and will meet the No. 2 seeds Yunseong Chung and Seong Chan Hong of Korea, 6-7(4), 6-2, 10-4 winners over unseeded Domagoj Biljesko of Croatia and Benjamin Hannestad of Denmark, in the final. The girls doubles final will see top seeds CiCi Bellis and Marketa Vondrousova of the Czech Republic take on No. 7 seeds Miriam Kolodziejova of the Czech Republic and Tereza Mihalikova of Slovakia. Bellis and Vondrousova defeated No. 3 seeds Usue Arconada and Fanni Stollar of Hungary 6-3, 6-4, while Kolodziejova and Mihalikova downed unseeded Francesca DiLorenzo and Caroline Dolehide 6-3, 6-2. 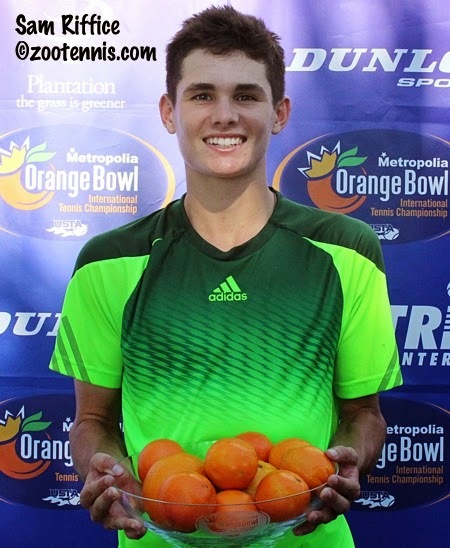 Eddie Herr champion Sam Riffice added another major 16s title to his resume Saturday, taking the Orange Bowl championship with a 6-1, 1-6, 7-5 win over No. 10 seed Mattias Siimar of Estonia. 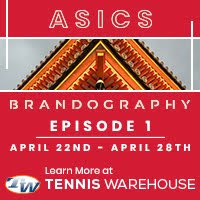 In 2006, 15-year-old Grigor Dimitrov of Bulgaria won both the Eddie Herr and the Orange Bowl, then both on hard courts, the only other boy to win the grueling back-to-back events, which have no day off between tournaments. Riffice said he had heard about his opportunity to equal Dimitrov, now No. 11 in the world, but didn't think about it during the final. "I read about it yesterday and thought it would be cool if I could do it," said the 15-year-old from Roseville, California. "I'm honored to have the same accomplishment as him." Late in the third set, Riffice looked to be a long shot for matching Dimitrov, with Siimar serving for the match at 5-4, after leading 3-1 and 4-2. But the wheels came off for the 16-year-old, who made error after error, was broken at love, then lost the next four points with Riffice serving to fall behind 5-6. He finally broke the string of nine straight points lost and went up 30-15 serving for the tiebreaker, but two more errors from the left-hander, both on shots well long brought up an abrupt match point. Siimar, who had roared back from poor play in the opening set to dominate the second, then double faulted, and Riffice toppled backward into the clay in disbelief at his victory. "He was just playing better than me flat out," Riffice said of the early games of the third set. "I just tried to not give him anything, make him win the match. I was able to stay in it and keep more balls in than him." Siimar was still trying to figure out what went wrong at the end of the match. "Something happened and I couldn't put any balls in, in the end," Siimar said. "I had thought I win this, because in second and third I was dominating and he didn't have a chance. But I just fall off in the end. I didn't think anything, just go offline." Siimar will return to Estonia, and hopes to play higher level ITF events next year, as well as some Futures, where he recently picked up his first ATP point. Riffice will be training for several weeks with USTA Director of Coaching Jose Higueras and USTA National Coach Sylvain Guichard in Palm Springs, then will begin his 2015 season with five ITF junior events in South America. While Riffice's win was the first for a US boys since Alexios Halebian won the 16s title in 2009, girls 16s winner Bianca Andreescu just added to her country's dominance. With eighth-seeded Andreescu's 7-5, 6-3 victory over No. 11 seed Dominique Schaefer of Peru, she became the fourth straight Canadian champion in the girls 16s. The opening set saw Andreescu save a set point serving at 4-5, then pick up her return game at 5-5, hitting two return winners, the second on game point, to serve for the set. She double faulted to start, but got her forehand working on the next two points and Schaefer contributed two errors to give Andreescu the game and set. Andreescu held serve throughout the second set and earned breaks in the fifth and seventh games to serve for the match. She didn't convert her match point in that game, and Schaefer broke, but Andreescu came up with some of her best play of the match in the final game, hitting a return winner, a forehand winner, a net cord winner, and on match point, a backhand winner. "I didn't play my best, but she was missing and I was missing," said Andreescu, who uses visualization to help her handle the mental part of the game. "But I think I was more consistent than her and I was winning the big points, which helped me." Schaefer regretted not using more variety as the match began to slip away from her. "I played pretty well, but I didn't mix the ball around that much," said the 15-year-old, who lives in California. "I think she liked the pace and that's how I played, so I think I should have sliced a little more, mixed shots more." 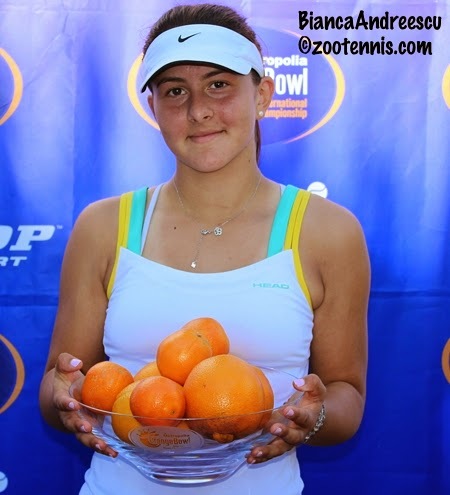 Andreescu, who won the Les Petits As title in January and trains with Tennis Canada at the National Training Centre in Toronto, said she is playing the Junior Orange Bowl next week, but added a conditional "maybe." Saying she was relieved that she wasn't the one to end the Canadian winning streak, joining Erin Routliffe, Gloria Liang and Charlotte Robillard-Millette, Andreescu had a simple explanation for their recent dominance. The schedule for Sunday begins with the girls singles final at 10 a.m., followed by the boys singles final, then the girls doubles final and the boys doubles final, all on Stadium Court at the Frank Veltri Tennis Center in Plantation.